Another of our spring projects this year is moving our high schooler into our college kid's old bedroom, and turning her bedroom into a guestroom. We'll probably recycle most of the furnishings from the college kid's room for the guestroom, but it's time I replaced the ancient particle board bookcase he used for eighteen years with something a bit smaller and guest-friendly. Of course there has to be a bookcase in the guestroom; to me a room without books is boring and lifeless. The problem with bookcases are that 90% of them are basically designed to resemble open-fronted rectangles, rather like refrigerator boxes with built-in shelves. Functional, yes, inspirational and/or decorative, not especially. While I appreciate the many utilitarian shelves I use for storing my collection, for a guestroom I'd like something different, maybe quirky or arty and more fun than a big box (without being so weird it gives our guests nightmares.) It would be really neat if someone designed bookcases with themes from genres, series or even individual titles, wouldn't it? CustomFurnitureOnline.com's prices for their handmade furnishings are most definitely beyond the reach of my budget, but two of the bookcases on their site caught my eye. This first one reminded me of that old nursery rhyme that started off with "There was a crooked man and he walked a crooked mile . 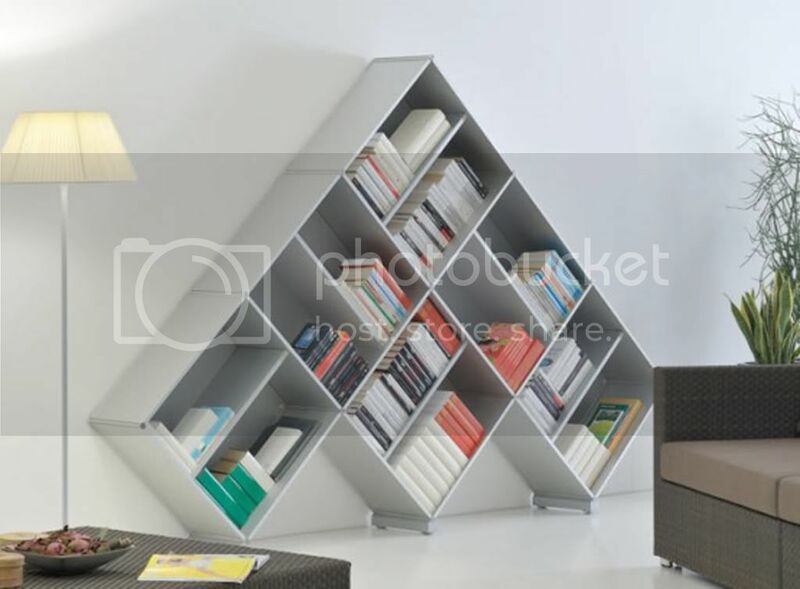 . . " Visually it's wacky, fun and appealing, and it looks as if it would fit in the same space as a traditional bookcase. I think this crooked charmer would work great in a child's room, too. My only reservation (aside from the hefty price tag) is the narrowing of each shelf at one end; you'd likely only be able to fit paperbacks or some low-profile art object on that side. Also the slanting of the books might bother some people who prefer to read non-tilted spines. 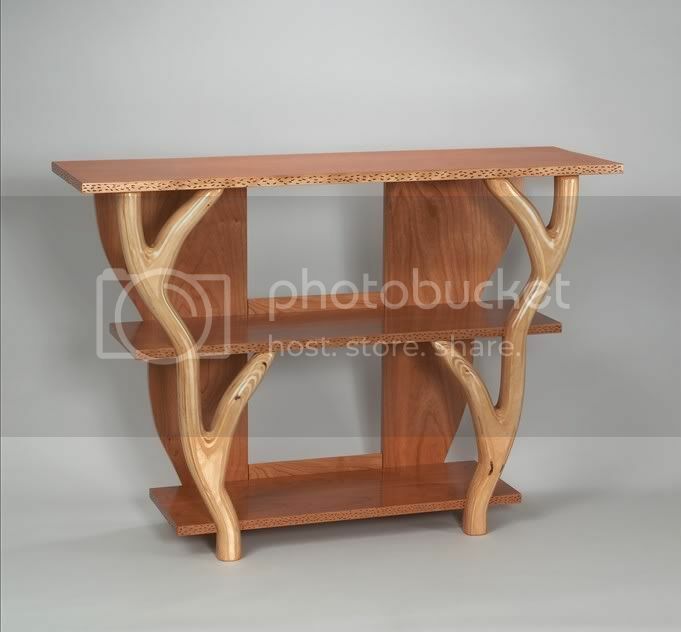 Another, smaller design offered on their site is this three-shelf unit that includes two front braces either carved from or carved to resemble tree branches. I liked this shelving unit because it is more suitable for limited space (the room we'll be making over is the smallest bedroom in the house.) The open sides and curving front braces also help it avoid that refrigerator-box feel; it made me think of the great treehouse from Swiss Family Robinson. I'm not particularly in love with the appearance of the wood they used for the backing and shelves, though, because it looks a lot like the cheap plastic veneer-particle board stuff they use for bookcases you can buy for thirty bucks from Wal-Mart. I think a darker wood would have contrasted better with the prettier front branch-shaped braces. 21st-design.com offers this unique Wintertree design bookcase that I instantly imagined right at home in any kid's library or school media center (the first book I'd put on it would be Where the Wild Things Are. It's stark enough to work just as well in some artist's loft in Soho, too. And wouldn't it be great if you could stretch a hammock between two of these bookcases? I'd probably spend every afternoon curled up there with a book. The problem here is the height; I'm guessing that short folks like me would only be able to reach the first two or three shelves. Also, stability -- unless the base is heavily weighted, it would probably be easy to to tip over and topple this tree. Iroonie.com has one of the topsy-turvey bookcases that I've seen used by some publisher somewhere (can't remember off the top of my head now.) It sets the traditional bookcase on point, something we quilters do with patchwork to get a different perspective, so any of Jennifer Chiaverini's Elm Creek Quilts novels would look at home in this. In fact I can think of dozens of geometric quilt patchwork designs that would make wonderful bookcases. You'd need a lot of wall space, however, to accommodate a good-size version of this design because the base ends up being so wide. This time the incline of the book spines actually bothers my eye; I don't like the look of that. 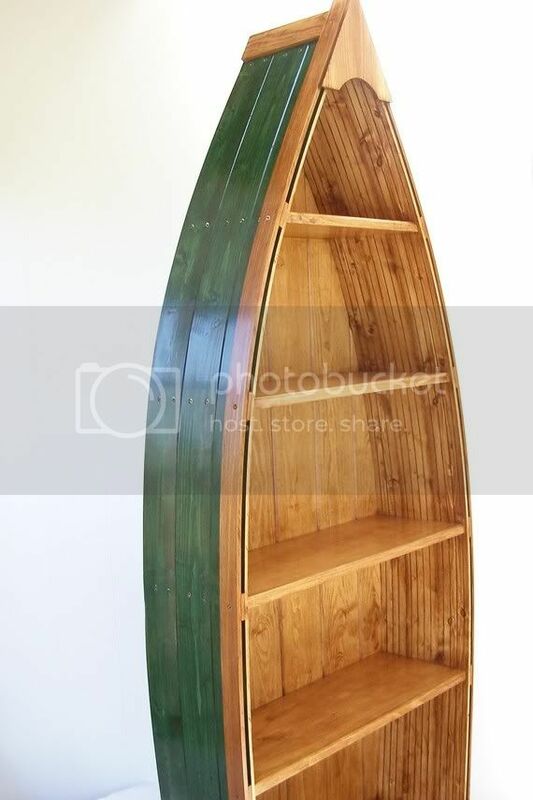 Since my guy and I grew up by the sea, when I found this boat bookcase on Etsy I immediately felt lust in my heart. I like everything about it: the craftsmanship, the contrasts between the natural wood and the painted outer hull panels, the combination of functionality with art and the quirkiness of a boat-shaped bookcase. It's also a visual metaphor for exactly how books can whisk us off on exciting journeys. When you look at something like this as a theme it inspires you; you could literally build an entire room around this one bookcase -- and promises to be a lot more fun than just going with colors, patterns or furnishing styles. That said, as much as I like the boat bookcase, Hemingway's The Old Man and The Sea is not the look that I want for this room. So I'm still looking around, but I'm sure when I see the right bookcase I'll know it. Or maybe I'll design something myself based on themes from my books. I could do a spaceship with shelves for StarDoc, a suit of medieval armor for the Darkyn, a double helix for the Kyndred . . . makes me wish I was a carpenter. What sort of bookcase(s) do you have in your favorite reading space? 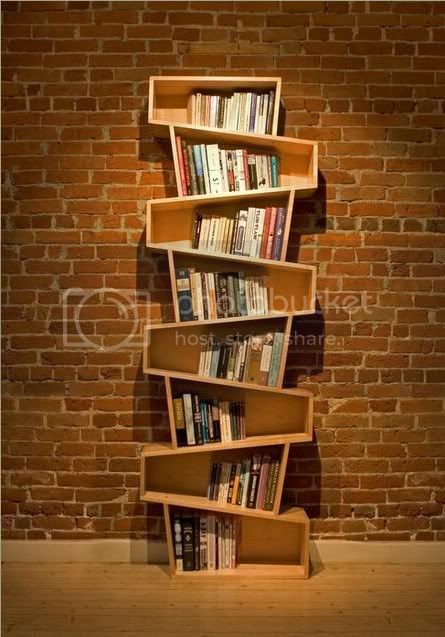 Have you come up with a unique way to make a place for your book collection? Let us know in comments. You certainly found some attractive alternatives, though ... more ideas. Now I just need a handy carpenter. I'm afraid mine are as boring as they come. With the exception of three hardwood bookcases, the rest are Ikea Billys. I like the size and number of shelves while moving them (and my desk which is the same breakdown architecture) was a dream when we left the Bay Area for Reno. And though they're made of particle board, the ones I chose have a well done veneer with wood grain so they pretend to be real wood well. My mom was an excellent woodworker, until her RA made it too painful. One of the things she did in the stairwell of her old condo was put in a set of shelves just tall and deep enough for mass-market paperbacks. The set ran the width of the stairwell and about 7 feet tall. It fit a lot of books, and took up very little space. I've been searching for a bookcase!! And I don't want such a simple-dull bookcase that you always see to hold my wonderful, magical books. I'm having a complete want moment on the first two... 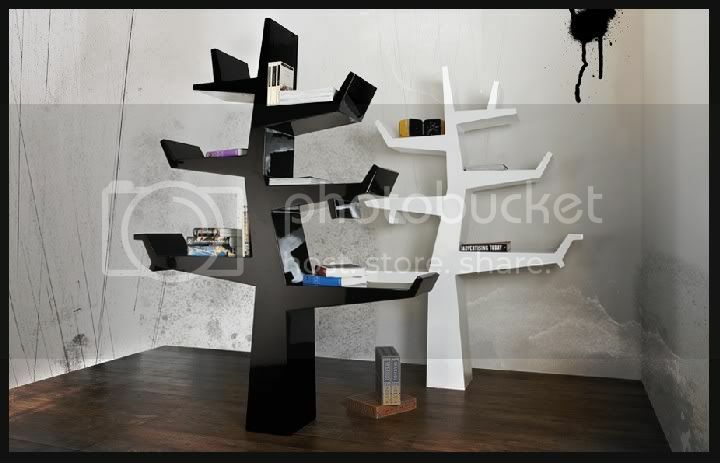 I like the tree one but it wouldn't hold enough books. We currently don't have bookcases, because the husband got fed up with crappy quality, bought wood-working tools and started designing his own. Since his time is limited, we may be caseless for a while, but these images make me feel a lot better about waiting! You know what books would fit perfectly in the wacky crooked bookcase up top? Dr. Seuss books. Doesn't it look just like something out of his imagination? I like the first image. Yeah it gets you thinking all kinds of inventions. Stairs came to mind with some sort of access, even on steps to the attic. Hubby and I moved last year from a 5 bedroom house to a 1 bedroom apartment. Most books went to good homes, others went to Goodwill, and all the favorites -- like old friends -- came with us. Mine are mostly romance and reference; hubby's are non-fiction. I bought simple milk case type boxes and stacked them so there are more shelves on the lower levels than the upper ones. We bought one tall wooden case with adjustable shelves, which I commandeered. Paperbacks are stacked three deep on every shelf, with one reserved for bigger hardbacks. To me, the important thing about our previous home wasn't the built-in shelves on either side of the fireplace, or the library-like room with shelves on nearly every wall. The books themselves were the treasure. We moved so that we could start over. All our children are grown and gone, and we wanted to simplify our lives. Hubby is beginning a new career and going back to school. It's like stepping back in time and being poor college students again. Our new surroundings are similar to the ones we had at the beginning of our marriage, 37 years ago. Once hubby finishes school and we settle into this new phase of our lives, we'll begin rebuilding our library with new keepers. I'm happy with the basics for now, and hope the future will bring fresh ways of presenting and preserving our old friends. I keep mine pages down inside the drawers of a lateral filing cabinet in alphabetical order by author. I know Office Max is selling a leaning bookcase. It leans against the wall. It has five shelves; each one is narrower than the lower one. I thought it'd be great to store kids books of different ages--picture books on the bottom with novels at the top. Anything that will hold books and not fall over is what works at our house. We have some wooden "classy" bookcases, some home made ones, and a whole lot of the cheap, folding bookcases that you find in the lower class box stores. They all work fine. I tend to vote for books over style, especially when I think how many more books I could get if I didn't spend a lot of money on bookcases. Everything that'll hold books. The rolling cart my mom gave me, the sewing machine table, the tops of the dressers and every bookshelf I can get my hands on. I haven't had the money or the opportunity to buy "cool" bookshelves for my library and I think I'd rather spend the money on more books. :) Although, I have a fondness for that Topsy-turvey bookcase. I plan on putting my spare bedroom closet to good use and put bookshelves in it and use the top closet shelf also. Whatever you do, please don't do one of those shelf-made-of-books monstrosities. I cringe every time I see those pictures. The "branch" shelf looks more like antlers to me. Thinking about branches, though, makes me wonder about putting together a bookcase sort of like wicker-framework - and then instead of wicker, weaving branches from curly willow trees into it. I like the crooked one. That style would work well for children's books, since they come in all different sizes. The tree appeals to me visually, too - but I can't see actually having one in my house. Our book storage? Uh... desperation style. Combination of "cheap rectangle bookcases" and "cinderblocks and pine shelves". Goes well with our decor, which I call "modern kid". Emphasis on artwork in various mediums... crayon, pencil and paint on paper, odd paper constructions, cutouts and models taped randomly on walls, plus detailing in marker, glow-in-the-dark fingernail polish, and purple glitter glue pen. With bonus stickers.